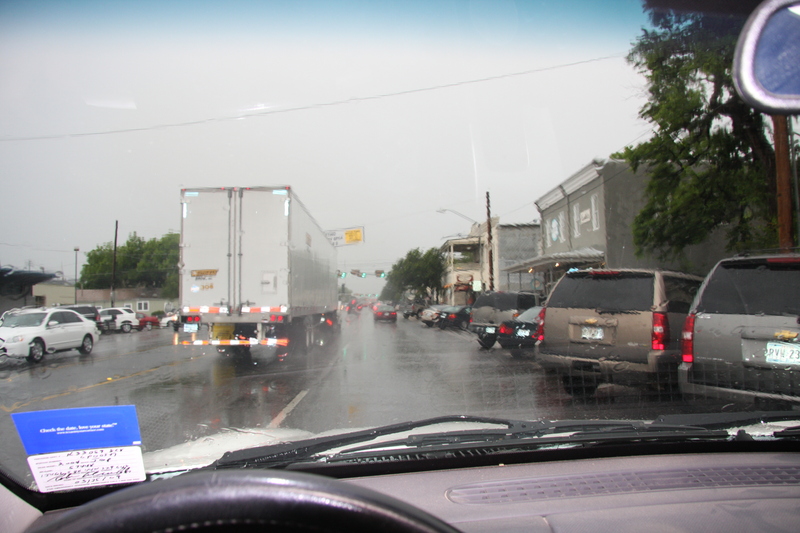 On Saturday, May 16, 2009 we awoke to a dark and cloudy morning. 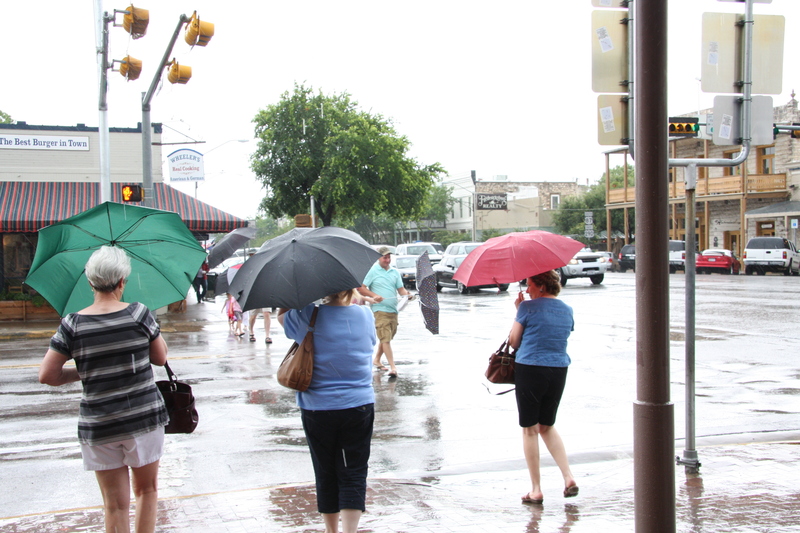 The television reported rain in Llano and headed our way. Shortly, we heard the beautiful sound of raindrops on our tin roof. A few at first, then a torrent. 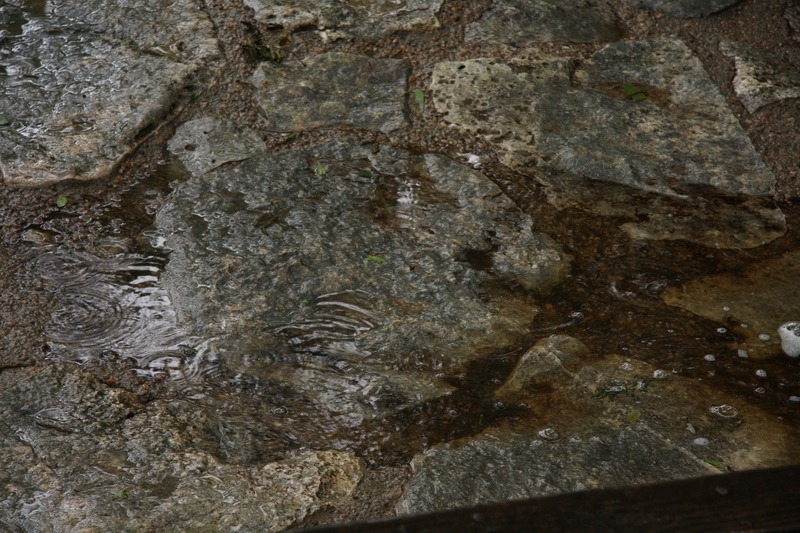 The patio soon glistened with pools and rivulets. 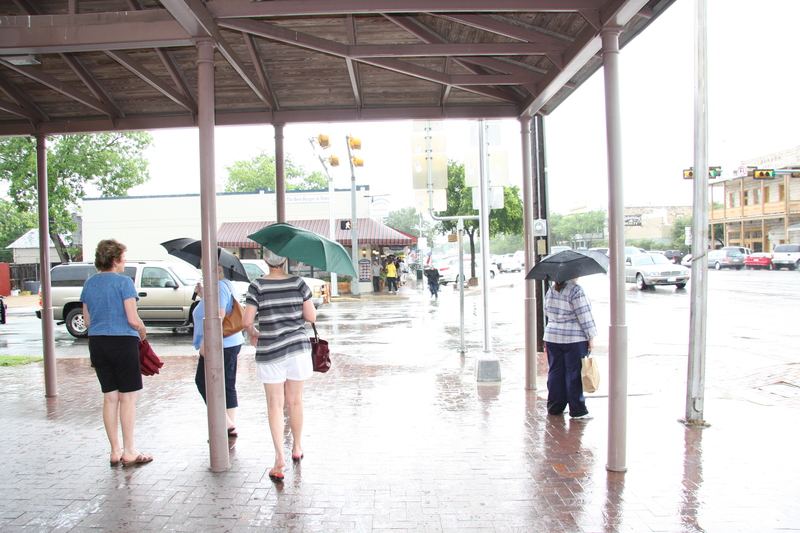 Rain is a welcome happening in Fredericksburg and is best enjoyed by being out in it. So Sunya and I got into my Jeep to see how everyone else was celebrating. 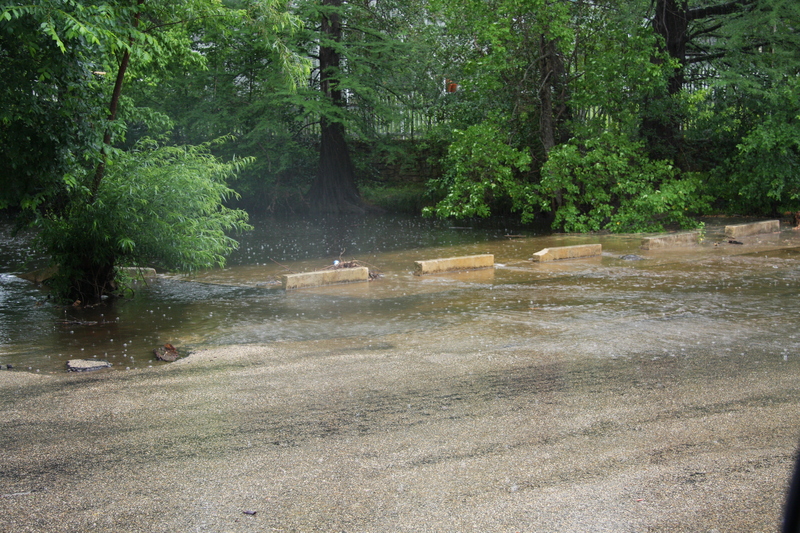 We first checked to see if Town Creek was flowing over the water crossing on Schubert Street. This is called the Duck Crossing. 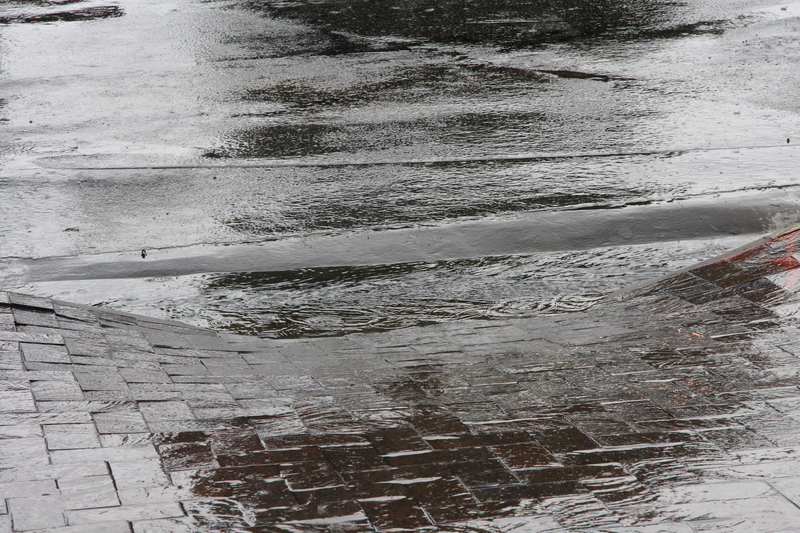 Sure enough, the water was flowing over the street, but just barely. Then we checked out Main Street. Wow! Wall to Wall cars. on a Saturday Morning and in the rain. What were all these people doing? They were looking for a parking place so they could join the Umbrella parade. and where was the parade going? Wherever it was going it did not let the water flowing in the street gutters stop it. Shortly after noon our rain storm moved off to the East. 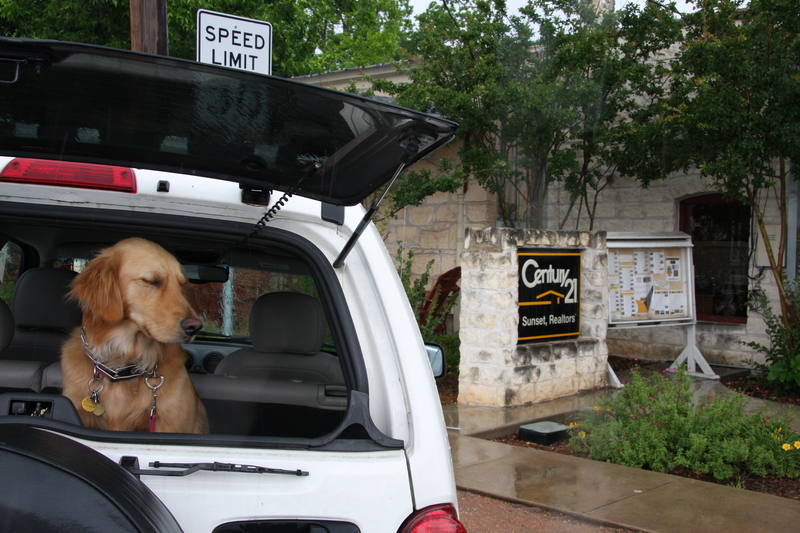 Headed for Johnson City and Austin. But it did leave us with .83 inches in our rain gauge and with happy grass, trees and visitors. 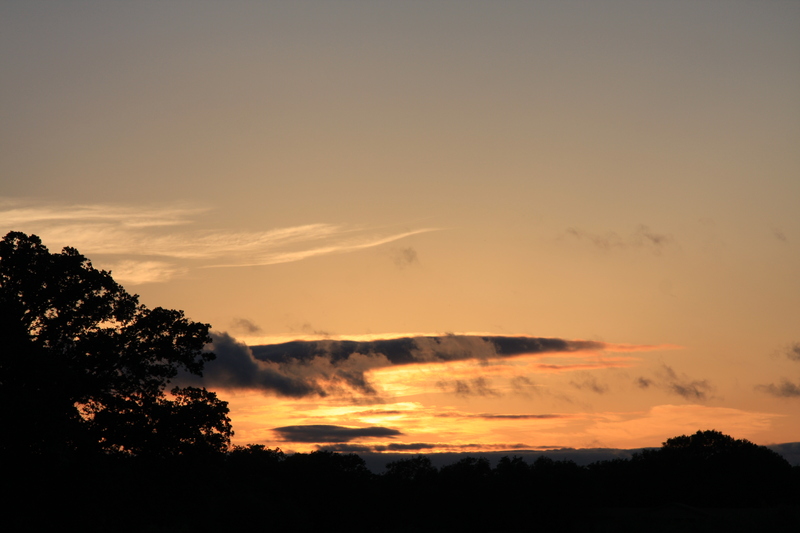 And as if we had not been blessed enough by the beautiful rain, the sun, and lingering clouds provided the perfect sunset for those lucky enough to be here. Sunya did have one complaint. she did not get to run in the rain. Maybe next time. U.S. home prices have declined across the nation in the past year—albeit at varying levels. Latest national price declines range from as little as 4.5 percent (Dallas, Texas) on a year-over-year basis in February to as great as 35.2 percent (Phoenix, AZ) according to S&P’s Case-Shiller Home Price Indices. It is the anticipation by many prospective buyers for further home price erosion that keeps them on the sidelines and from participating in homeownership despite the lowest interest rates since Freddie Mac commenced the statistical series in 1971. While further price declines may be realized, the likelihood of rising interest rates makes purchasing now a better option than waiting for further potential value declines. Simply stated, there is a greater possibility of interest rate increases than potential value declines. Even with the price decline, the interest rate increase may result in the buyer no longer being able to qualify for a loan on a home they wish to purchase for which they qualify today. Despite facing a potential in declining home values, now may be a better time to buy. To make the comparison simple, let’s assume a loan amount today of $100,000 with a 30-year fixed-rate residential loan at 5 percent. Nationwide at the time of this writing, the average 30-year rate was 4.85 percent per Freddie Mac. A buyer today at 5 percent interest borrowing $100,000 has a monthly principle and interest payment of $536.82. If prices decline 5 percent (and the loan amount does also) and interest rates rise just ½ of 1 percent, then the monthly payment remains the same ($539.40). So if rates go up just 1 percent to 6 percent per year, then prices must drop at least 10 percent for that same buyer to qualify for the same monthly payment. A 1.5 percent increase in rates to 6.5 percent requires a 15 percent price decline, and a 2 percent increase necessitates a 20 percent price decline to qualify. Why will rates increase in the future more than prices decline? Looking at the S&P’s Case-Shiller Home Price Indices, the aggregate 20-city prices have already declined 29.1 percent since peaking in July 2006. For many cities, much of the price decline has already taken place. And Austin has seen very little decline in the median home price! And why will rates increase? Massive deficit spending has a high potential to drive up inflation and hence interest rates. Additionally, since these are the lowest rates since 1971, it’s not hard to project the likelihood of rate increases. So NOW may be the best time ever to buy a home and take advantage of truly historic low interest rates! Information provided by Ted C. Jones, PhD, Senior Vice President—Chief Economist, Stewart Title Guaranty Company. Enjoy making the Mom in your life this YUMMY recipe! 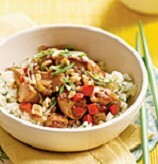 Top tender chicken with an inspired Asian sauce loaded with cashews, ginger, honey, and sesame oil. Pair this entrée with a simple rice pilaf. May 8, 2009 Posted by c21sunset | Fredericksburg TX	| Century 21 Fredericksburg Texas, Fredericksburg, Fredericksburg Real Estate, Fredericksburg Texas homes, Fredericksburg Texas properties, Fredericksburg Texas Real Estate, Fredericksburg TX, Fredericksburg TX homes for sale, Fredericksburg TX realty, fredricksburg homes for sale, Fredricksburg TX real estate, hill country acreage, hill country land for sale, hill country ranches, Hill Country Real Estate, homes, homes for sale, homes for sale Fredericksburg, homes for sale in Fredericksburg TX, Texas hill country homes | Comments Off on Happy Mother’s Day! For those of you who have read my previous blog entries on fly fishing in Crabapple Creek, this picture may be of interest. 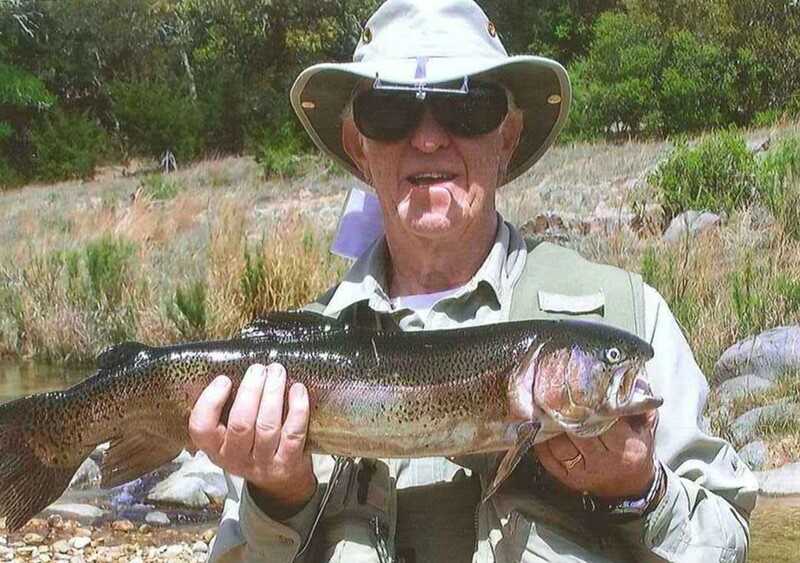 Because of warming waters, lease members are now permitted to keep the Rainbows they catch. My smiling friend, Jim Fox, put this 26 inches on his stringer last week. Being a native of Houston has given me the ability to truly appreciate the Hill Country of Texas. The character in land and the verity of the soils add such dimension to the topography here in Gillespie County that I am truly amazed on a daily basis by its beauty and serenity. It’s no exaggeration when I say the sun always shines in Fredericksburg. I am in complete amazement when I see how such little rain does so much for the country side. When the bluebonnets come, the people come and our small and sleepy town comes truly alive. 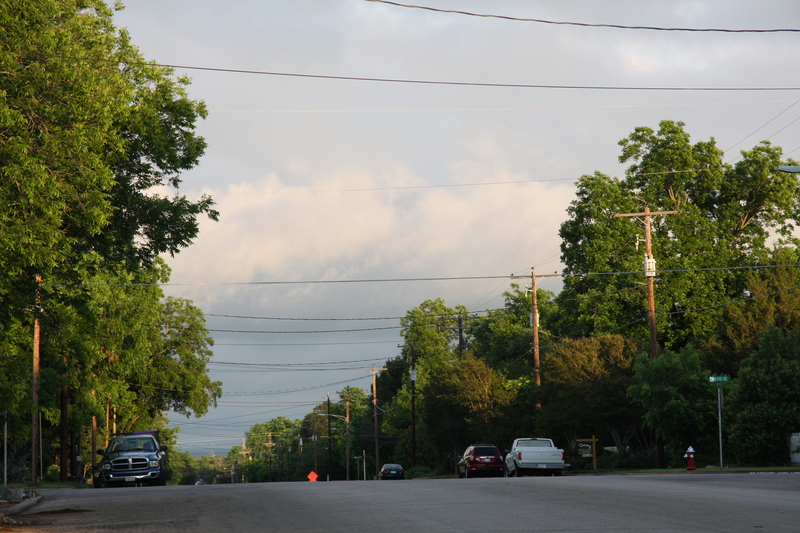 Starting my fifteenth year in Fredericksburg and with CENTURY 21 Sunset, Realtors allows me to see the changes not only in the real estate arena but our town. The hospital, housing, and restaurants have doubled. There now is a four screen theater to watch a movie. New wineries, vineyards and tasting rooms where you can visit and enjoy are part of our lives now. Wildseed Farms also attracts many people with its magnificent flowers. This is only to name a few of the changes, and for the most part, all to the good of Gillespie County. My formal education in Art and Design, together with my real estate knowledge has blessed me with the privilege to design and restore three Historic properties here in Fredericksburg, one of which is my home. There is no doubt that I have a deep passion for real estate and homes, and home is truly where the heart is. I am the path home. Click my picture to search for Gillespie Country properties. We have seen the enemy, and it’s us. If we sit back and wait for someone else to pull us out of this economic mess, I promise you, it will last a long time. Do you remember the days when we would catch the evening news at 6:00 PM and get all the news we needed, both local and national in about 20 minutes? If we missed anything, we could catch it again at 10:00 PM before we went to bed. Now we have an endless number of 24 hour news channels that are hashing the same stories over and over and building fear because that’s what we like to hear. Stop it!!! Tell everyone you know to STOP IT!!!! The recovery starts with us, with our attitude, our faith in each other, in our families, and in our friends. This country has been through tougher times than these…. Let’s get over it.